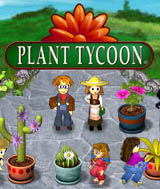 Plant Tycoon® is a gardening simulation game where you nurture plants and experiment with increasingly rare and valuable species. Breed and cross breed plants until you find the 6 Magic Plants of Isola and solve the genetic puzzle. Start with a small amount of cash, a handful of seeds, and some basic soil and water. Grow plants, organize and harvest seeds, monitor your plants´ health, age, and maturity, and protect your plants from dehydration and infestations. Sell some of your creations to fund your research, buy better supplies to use in your nursery, and purchase improvements and ornaments to customize your virtual garden. Can you find the 6 Magic Plants of Isola? Over 500 different species of plants to discover. A wide variety of collectible insects to retrieve. Dozens of different kinds of seeds to experiment with. Prune your plants to remove dead foliage and customize the look of your creations. Gorgeous artwork with detailed, dynamically-generated plants. Comments: What an awesome game! After several restarts of the game, finally went to a site that gave a suggestion on how to start. Just that one thing made all the difference. So much variety and planning to this game. Liked the stats on the Collection page too. Surprised at the amount of real time I have been playing. Only six more bugs to collect but only 61 plants discovered out of over 500! Want to try to discover all of them and then start again. It keeps playing even when you don't, so is nice to be able to set it to stop. I am repeating myself with this -- what an awesome game! Comments: I love this game. You get a chance to grow plants and learn the different names and types of plants. This is also a relaxing game for when you just want to sit and play a game that is not too hard or too easy, it is just the right pace.